Henri Namphy was a Haitian general and political figure. He served as President of Haiti's interim ruling body, the National Council of Government, from 7 February 1986 to 7 February 1988. He served as President of Haiti from 20 June 1988 until his deposition on 17 September 1988 in the September 1988 Haitian coup d'état. Henri Namphy was born in Haiti on 2 November 1932. He was originally from Grande-Rivière-du-Nord, a bucolic town on the outskirts of Cap-Haitian, Haiti's second largest city. 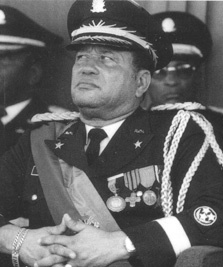 Following the fall of the government headed by President-for-Life Jean-Claude Duvalier, who fled the country with his family in 1986, Lieutenant General Namphy became president of the interim governing council, made up of six civilian and military members, which promised elections and democratic reforms. His regime was given the moniker “duvalierism without Duvalier”. Namphy, who enjoyed a reputation for being honest and apolitical, had trouble in his early weeks in power; Haitians ceased their celebrations over the departure of Duvalier and started rioting and looting. In March 1986, as violence swept the capital, Port-au-Prince, the popular justice minister resigned from the ruling council and Namphy dismissed three other members who had close ties with the Duvalier regime. The new council had two other members apart from Namphy. The council had difficulty in exerting its authority because of frequent strikes and demonstrations. An election held in October for a constituent assembly to prepare a draft constitution reflected a lack of public interest in determining the country's political future. The first attempt at elections, in November 1987, ended when some three dozen voters were massacred. In January 1988 Leslie Manigat won an election that was widely considered fraudulent, and Namphy overthrew him on 20 June in the 1988 Haitian coup d'état after Manigat had dismissed Namphy as army commander. Namphy remained in power until 17 September 1988, when he was deposed by a group of young officers organized by General Prosper Avril, in the September 1988 Haitian coup d'état. Namphy lived in exile in the Dominican Republic, which shares the same island of Hispaniola with Haiti, after a 1988 coup by non-commissioned Haitian army officers toppled his three-month military government. He never returned to Haiti despite the proximity. Namphy was married to wife Gisèle Célestin. His brother, Joe, who died in 2010, was a prominent South Florida businessman who once managed the Miami Toros soccer team, which became the Fort Lauderdale Strikers before folding in 1997. Joe Namphy also played for Haiti's famous Victory football club in the 1950s and headed the Haitian Football Federation in 1974 when the national team reached the World Cup. Namphy died on 26 June 2018 in the Dominican Republic of lung cancer. He was 85.